Paying off credit cards with high interest rates can be extremely difficult. The finance charges essentially take over your minimum payment each month so you barely get anything paid off. That’s at least what it feels like. Although they don’t all involve paying off your highest debt first, here are some tricks to paying off credit cards with high interest rates that you can try. Creditors are sometimes willing to give you a lower interest rate if you’re a good cardholder. If you’ve made all of your payments on time or only had one or two late payments, then it’s likely they’ll give you a break. Also, if you have offers for lower interest rates from other credit cards, you can use that to bargain with your creditor. 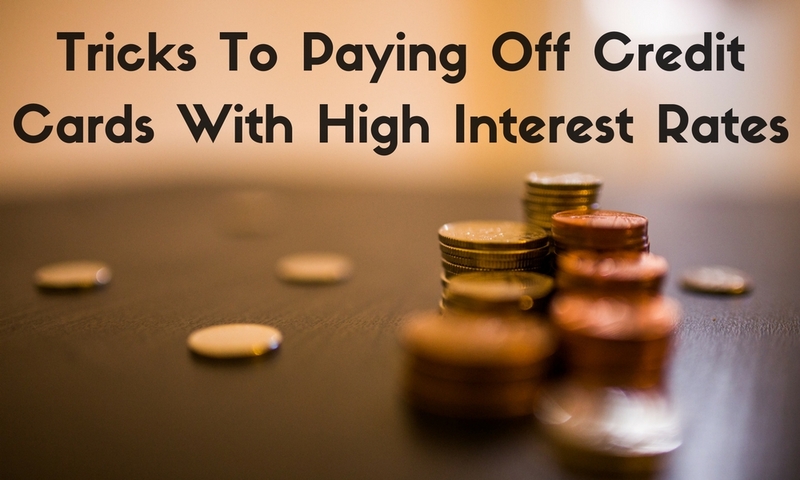 Having it at a lower interest rate might just be what you need to get the debt paid off. And if you have great credit, you could qualify for a good balance transfer interest rate. Don’t only look at balance transfer credit cards, though. Consider rewards credit cards too, because they have some of the best balance transfer rates. If you don’t have enough available credit to move the entire balance to another card, don’t worry, even moving just part of the debt will help a lot. Maybe paying your bigger debt first isn’t the right plan for you. If you instead pay off smaller debts first, that would free up money that you could put toward your larger debt. Start by making a list of your debts, and as you pay them off, take those payments and put them toward the next one on your list. When interest is high, a lot of your payment is going to that, so you have to try to pay a little more each month to actually make a dent in the amount that you owe. One tactic to consider here is paying the minimum on all the lower interest rate debts and putting all your extra money into your higher interest rate debt. Then, once you’ve paid off that debt, you move on to the debt with the next highest interest rate and continue until you have paid off all your debts. Is there anywhere in your day-to-day life you can cut back? Maybe you can eat out less, stop for coffee only two mornings a week, or cut back on the tv channels you’re paying for. Cutting out expenditures that you don’t absolutely need could get you some extra cash to pay off that huge debt that’s hanging over your head. Then, once you’ve paid it off, if it’s in your budget, perhaps you can add everything back in. Sometimes it just has to be this way. If you absolutely cannot find any extra cash to put toward your goals of getting rid of your debt, then hold off until you have some. Continue to make the minimum payments on all of your credit cards and pay a little more when you can. Do you have any questions about paying off credit cards with high interest rates? Let us know! To enlist the help of a trustworthy, effective credit repair company, call us today at 1-866-991-4885!